This kit includes the Koolhaas hat pattern download and one skeing of Bijou Bliss yarn in Natural Cream. They're back! Due to the overwhelming response the Knitting Daily Shop's Koolhaas Knitted Hat Kits, we've brought them back in cool summer shades. We have limited supply of these popular Kits, so don't miss out! Order your Natural Cream Koolhaas Hat Kit today. Inspired by the architectural aspects of Rem Koolhaas, this hat is a combination of strong geometrical structure and texture. 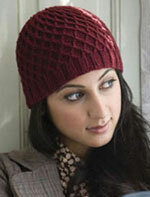 Originally published in the Interweave Knits Holiday Gifts 2007 special issue, this unisex hat has been a favorite of knitters of all skill levels. The luxury and softness of 50% Pure Yak combine with 50% American Cormo Wool for incredible hand and drape. From Bijou Basin Ranch, this yak/cormo blend is a perfect yarn for the Koolhaas hat with its elasticity and stitch definition. Each 2 oz. 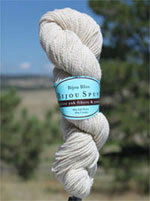 (56 gram) skein contains 150 yards, 16 wpi or light worsted weight yarn. This Koolhaas Knitted Hat Kit has everything but the needles! Order your Kit today! *Hurry! We have limited quantities of each Koolhaas Hat Kit. When they're gone, they're gone.